Today, major brands are hitting home with consumers by coming into their communities to enhance their environments. This move to improve has grown into a movement that’s known on the streets as “tactical urbanism.” It integrates experiential, purpose, and content marketing to transform an urban space into an engaging experience. And the results are often a thing a beauty, from fresh coats of paint on older buildings to lovely gardens in concrete jungles. They inspire people to see and share them while engaging with the companies that created them. So in addition to making cities look better, these efforts let brands put their best faces forward. To see how brands are taking on tactical urbanism, TheGuardian.com shared the best on the street. Absolut Vodka is a brand that’s built its image by using creativity to inspire transformation. This led to their partnership with the Lowline in New York City, which is an urban effort to develop a solar-powered underground garden in an old transport hub in downtown New York. The goal is to make it into an underground version of the High Line, which is popular park built on a former railroad located high above the city. Absolut saw this as a prime opportunity to both support New York City and promote their brand to change one of the greatest cities for the better. Another brand striving to add meaning to its marketing is a paint company called Dulux. With the goal of adding color to people’s lives, the brand has been running its Let’s Colour global campaign which donates paint to local communities and global public organizations to make their worlds more beautiful. The campaign recently brought the brand to Belgium where they provided a colorful makeover to the city of Charleroi to help it rise above its shameful naming as the world’s ugliest city four years ago. 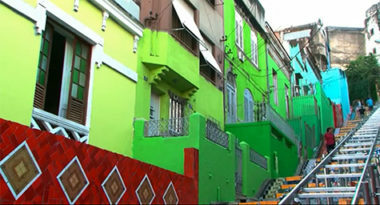 Dulux worked closely with the city to re-paint some of its least popular buildings. The enormous project involved more 600 people and 15,000 liters of paint, but ultimately brought beauty to the lives of the city’s 200,000 residents. The Let’s Colour campaign was captured through images and video, as well as through personal accounts of those involved featured in the brand’s print magazine. Together, they provided a moving and meaningful view of this collaborative community effort. As you can see, tactical urbanism may be based in marketing, but it’s built on bringing more meaning to the citizens, cities, and communities it impacts. It’s not about seeking publicity, but rather seeking purpose to bring a better life to communities through engaging, enjoyable experiences. Keep up with what’s up in marketing. Contact MDG Advertising. MDG Advertising, a full-service advertising agency with offices in Boca Raton and New York, NY, is one of Florida’s top marketing companies and branding firms. MDG’s core capabilities include advertising, branding, logo design, creative, infographic development, digital marketing, creative media planning and buying, radio and TV advertising, Web design and development, email marketing, content marketing, social media marketing, and SEO. To stay on top of the latest trends in marketing and advertising, contact MDG Advertising.